Prove to the whole world that you are the most powerful and greatest Lord! Fight against thousands of players from many countries in the alternate Middle Ages of Throne: Kingdom at War! Become a powerful Lord and your Palace will serve as the starting point for many glorious military marches and your triumphant army will be famed throughout the Kingdom. Call the faithful to serve you – spearmen, knights, cavalry, ranged and siege warriors are ready to fight for you. The more enemy Towns you destroy, the more chances you have to survive and seize victory in the deadly battle for the Throne! Please remember: without allies, even a powerful Lord is just a lone warrior trying to oppose an entire army. Search for loyal friends who will help you excel in this relentless race for power in the world of Throne: Kingdom at War! Get ready to constantly improve and modify your Town. Remember that your people are willing to work hard and diligently! Build Farms, Lumber Mills, Mines and Stone Quarries. Attack other Lords and special locations on the Kingdom map. Do this and you will never be short of resources and always be able to help allies in need. Turn your attention to your army: the more Barracks and Infirmaries in your Town, the more successful your military campaigns will be! Conduct Studies and upgrade your Hero’s Skills to increase your influence on the life of the Kingdom. Take part in PvE and PvP confrontations and huge battles of hundreds of thousands of warriors, assert your Power, yield valuable materials as war trophies and craft better and better Hero’s equipment! Remember that history is written by the victors! Clashing with every Lord who crosses your path may make you more enemies than you can handle. 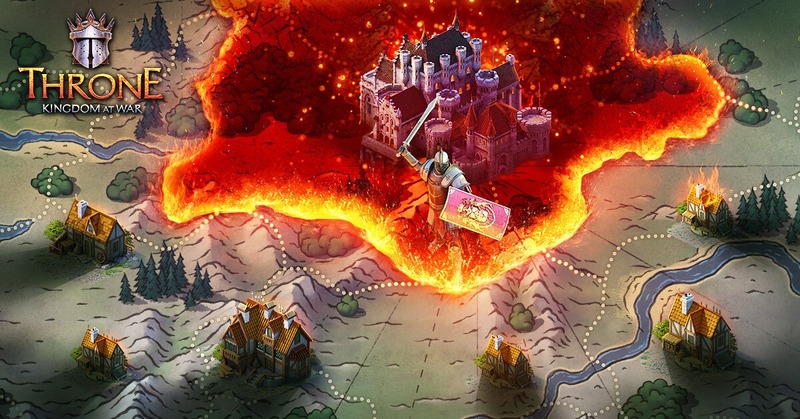 Find loyal allies that can lend you a helping hand: join already formed alliances of Lords or create your own Order, coordinate joint attacks on stronger opponents, exchange resources and fight other Orders in intense PvP battles for the right to control a unique location – the Eternal Stronghold. The great Order Masters are the true creators of the Kingdom. Lead your brothers-in-arms to victory and glory in Throne: Kingdom at War!